Things go right at work most days – and there is a lot we can learn from that. That is the message from our latest industry story – involving Hancock Forest Management NZ. HFMNZ noticed that one of its operations, at the Tiaki Estate in the central North Island, was performing very well on both health and safety and productivity. So, it decided to investigate why, with a view to sharing the lessons across its business. It set up Everyday Work Learning Teams made up of workers from the Tiaki Estate. The teams were asked to identify what enabled the work to be done successfully every day, despite varying conditions. Some of what the teams identified were things you might expect – like good planning and experienced people. But they also identified some intangibles – that wouldn’t be highlighted in a regular audit. These included things like, each person understanding the requirements of the next job and proactively working in a way that set up the work for the next guy. Learning from everyday work is a powerful tool because it focuses on setting people up for success. Congratulations to HFMNZ for doing this work, and thanks for sharing it with the industry in this case study. Inclusive and visible leadership: Bosses didn’t dictate, but involved crews in planning. Trust and respect: Having a small, stable crew built trust, so people spoke up and problems got resolved quickly. Teamwork and collaboration: People understood what was required for the next job in the process and set up the work so the next person could succeed. Cross functional skills: Everyone was trained to do several jobs, so there was always a trained person to step in if someone was away. We’re asking people to take part in a survey being run to get a stocktake of views from people in forestry, and to help evaluate the work of the Forest Industry Safety Council (FISC). FISC runs Safetree. Individual responses are confidential and won’t be seen by FISC. Only aggregated responses will be reported. The survey will take about 10 minutes. The results will guide FISC’s future workplan to ensure it reflects the needs of people working in the industry. Thanks for giving up your feedback. A reminder that these courses are running in Nelson, Gisborne and Whangarei in October and November. They are for crew owners and managers, foremen, supervisors and anyone else who leads people in forestry. They focus on helping you to lead a high-performance team that focuses on key results, including health and safety. See more, including course dates and how to register, on our website. 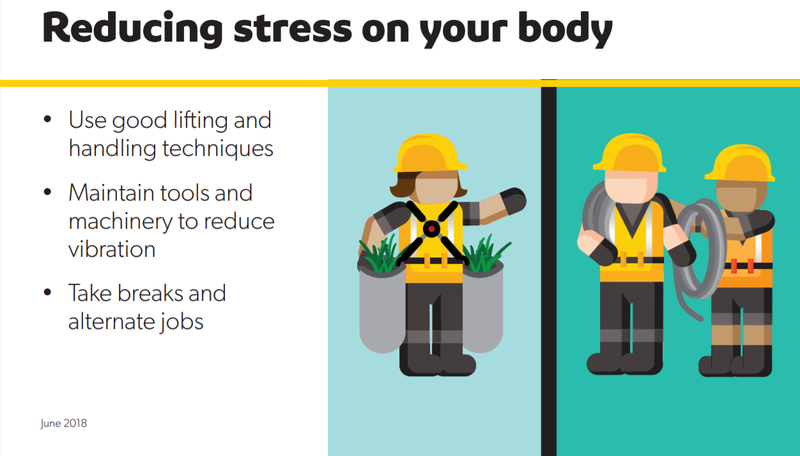 Holding or carrying a heavy load, working with vibrating machinery or tools, and repetitive movements can all put a lot of stress on your body. Changing the way you work, and lift and carry loads, can help. Bend your knees and tighten your stomach muscles (your core) so you’re ready to lift. Get a crewmate to help (eg, to lift heavy bags or get a load onto a ute). Make sure your load is balanced – use a bag with shoulder straps rather than just a cross-body strap. Cutting tools that aren’t sharp, or any tool that’s unbalanced, will vibrate more, which can cause vibration disease. Make sure all tools and machinery have effective anti-vibration mounts. Know how to use your tools the right way – after all, they’re there to make the job easier. Working one way all the time can stress the body (eg, using the same hand to reach, or walking the same way around a hillside), so swap around. If possible, swap jobs and tools with workmates – doing one thing for a long time increases your chance of injury. Even if you can swap jobs – and especially if you can’t – take frequent breaks and stretch your muscles. While they might not be critical injuries, body stress injuries can cause considerable harm to people’s quality of life and feature heavily in ACC claims. For that reason, Safetree supported the trial of a programme to reduce body stress injuries among silviculture crews. The trail involved trainers from Move@Work working with three silviculture crews showing them simple techniques to protect their body when working. A review of whether the training had a lasting impact on the workers found that six months later one crew was regularly using the techniques they had learned. They reported fewer slips, trips, strains and sprains. A second crew reported partial using the techniques, with some crew members still doing some of the stretches and exercises some of the time. A third crew wasn’t really using the techniques after six months. The review highlighted the importance of having ‘champions’ to embed new habits learned in programmes like this. It said the fact that thinning crews are paid by the hectare, not the hour, impacted on their willingness to spend time doing things that were not related to cutting down trees. The review also highlighted the opportunity to roll out this kind of training to tertiary institutions offering forestry courses, as well as the industry. WorkSafe has created some new resources to help prevent noise-induced hearing loss at work.